The Austin Pet Machine was designed specifically to help relieve the symptoms of common pet allergies caused by pet dander (dog and cat) and bird feather dust. The Pet Machine also uses a specialized carbon filter to reduce most odors associated with pets. 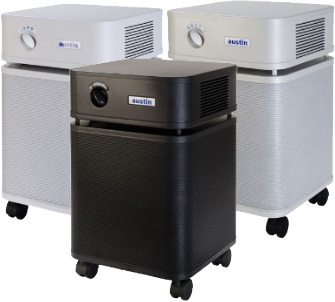 In addition to featuring a medical-grade true HEPA filter to remove common airborne allergens including dust mites, pollen, mold spores, and pet dander, it also features an activated carbon filter which removes odors and chemical contaminants. The HEPA filter is capable of removing more than 99.97% of all particles greater than 0.3 microns in size and approximately 95% of particles down to 0.1 microns. Recommended Application: This filter is a good choice for individuals with pets and who suffer from allergies associated with dog and cat dander and bird feather dust, or that are seeking to reduce common odors associated with their pets. Austin Pet Machine is designed for higher contamination levels or larger rooms and spaces up to 500 sq ft.